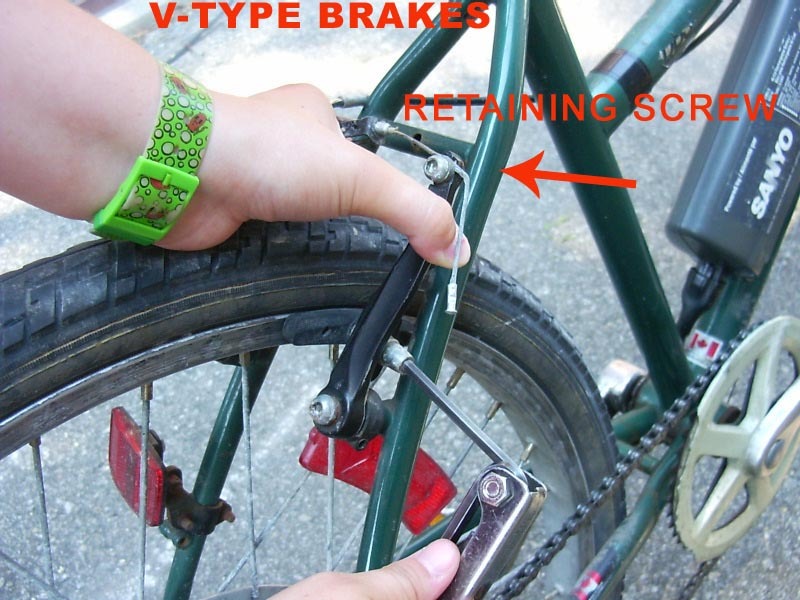 Free advice on how to fix your bicycle: By popular demand: Adjusting Brakes, yes you need those! 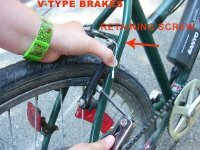 By popular demand: Adjusting Brakes, yes you need those! The one thing that is more important than the things that make you go on a bike is the one that makes you stop, the brakes. There are many types and I'll try to cover them all in this article. 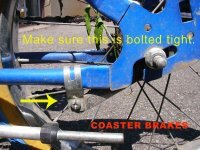 cables and adjustment nuts, check if your wheels are bolted straight on the frame or fork. Nothing will freak you out more then busting your head for an hour trying to figure out why the the damn thing can't be adjusted only to find out that the wheel was on crooked. 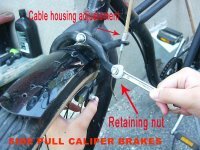 Make sure that all the cable housings are set in properly in the frame holders, the caliper and the brake handle. Make sure your pads are not worn out beyond salvage.Before you set yourself to adjust your brakes, make sure that all adjustement nuts on the caliper and brake handle are screwed all the way in. You might need to unscrew them later for a last minor adjustement. Replace any frayed cable as this is a sign of bad things to come. Buy those little cable ends that you squeeze on the end of the cable or melt some solder on it, it will prevent the cable from poking you and fraying of the cable. Lastly, the front brakes always work better than the rear. It's simple physics, the cable is shorter, less friction, quicker response. is your riding ability and a very good mojo. In my opinion, I think you guys are insane and I worship the the pavement you ride on. Be careful and light a candle at church once and awhile. coaster hubs have a tendency to commit suicide once violated. (For those who question my ability, I can rebuild a Sturmey Archer internal 3 speed hub.). If you ever experience smoke coming out of the hub while braking, you're going down a hill very very fast, you're burning the grease in the hub, you're on the wrong bike for the job and you're praying for dear life! SIDEPULL CALIPER BRAKES: These are the common brakes on older and cheaper bikes. Bikes that you and me ride. They are not the best but they do the job, most of the time. The worst combination would be a side pull caliper brake trying to stop a wet steel chromed wheel, remember that next time you ride in the rain. You'll need a 10mm open wrench to adjust the cable retaining nut on the caliper(Some calipers used other sized nuts sometimes) and the pads. First, make sure the pads are aligned with the rim and that you have full coverage. The pads should be parallel to the rim. If that's not the case, you can flex the caliper where the pad is to accomplish that. Remember this before you do that, steel bends and aluminium breaks. So make sure your caliper is made of steel before doing that. Now that your pads are square on and aligned with the rim, undo the cable retaining screw on the caliper, squeeze the pads on the rim, pull the cable to remove any slack and re-tighten the retaining nut. These caliper always tend to pull more on one side. To adjust this, play with the nut holding the caliper behind it on the frame or fork. This braking system has a lot of slack already built into it. Unscrew the cable adjustement housing on the caliper or brake handle to stretch the cable until satisfied. One last note on this type. Women's bikes usually have these brakes with the cable upside down on the back. This set up makes for accumulated water in the cable housing and rust forms jamming everything. Just switch the position of the retaining nut and cable holder on the caliper to fix this flaw. pads from the front or back of the bike, make sure that they are pointing up and not down at the rim. Down pointing pads will want to go under the rim and that will make for some interesting deccelaration that you do not want to experience. To center the pads with the rim, you may have a small adjustement screw or hex nut at the base. Screw in for the pad to move away from the rim and unscrew it to move closer to the rim. Play with this until you're statisfied. Safety note, if you have old cantilever brakes on the front with a center pull cable, make sure you have something between it and the front tire to prevent an endo if the main cable snaps. A fender is the best thing or a reflector bracket. Now go take a ride to your local bike shop and buy some v-type brakes. V-BRAKES OR SIDEPULL BRAKES OR ALLELUYA! : Simple, yet powerful. I love these, they are simple to adjust and all of them work great. All except the ones with the pads that have a post instead of a nut to attach to the caliper, like the cantilever brakes, avoid those at all cost. The cable adjustement is the same as the above, the retaining nut is usually an hex screw. First, make sure the pads are square on and parallel to the rim by unscrewing the bolt on the pad, with the hex key in there, push the pad on the rim. Now screw it in and you're done. Unscrew the retaining screw, grab both calipers, squeeze, pull the slack out of the cable and rescrew the retaining screw. You don't have to squeeze the calipers hard, there's not much slack in this braking system. To center the pads on the rim, play with the small adjustement screws at the bottom of the calipers the same as the cantilever brakes. Voilà, you're done. DISC BRAKES: No clue! I haven't had the chance to own or work on these. From what I hear they work great in any situation and of course they won't eat up your rims. ROD LINKAGE BRAKES: Unfortunately, these are not common brakes here in Canada and I never had the chance to work on these bullet proof brakes. Tip of the day: Buy a few brake cables ahead of time. They are cheap and it will save you a trip for the next time you need one. Keep one on your bike for emergencies. Hey, great blog. Fans of bicycles will be fans of this too. I'd like to tender another vote for a post on wheel-truing. I have a couple of different bikes, but I just picked up a Yugoslavian 3-speed coaster-brake fold-up bike from 1986 for $30. Any thoughts on fold-ups? I don't even need another bike, and I've never had any desire to own a fold up, but this one was just too funky-looking to pass up -- twenty years old and it bears a striking resemblance to some of the "creatively-built" stuff floating around the web. Hey Zafner, thanks for the comment. I've had a few fold ups that I have found in the trash and they are great fun. Especially when you want to bring a bike in the subway. Although it's on the heavy side, your $30 buy is a great ride to have, keep it. Newer fold ups go for $400 and more. A great addition to any bike stable. I've received many request for wheel-truing, keep posted. I will be posting this and other wheel stuff in the next 10 days. Great post! We want to change from cantilever to V-brake as you recommend, but is this possible? are the ways in which cantilever and V-brakes attach to the frame (ie the fulcrum) totally interchangeable? The answer is Yes, totally and without any problems. Hope my answer is clear ;) Enjoy better braking. hi gerry, first of all i would like to thank you for your site! great job man! I would like to built myself a bike, i already have the pieces i just need the frame, i mean is there some things that i should know before doing anything! thanks in advance! ps: never built a bike before! Dude just go ahead and do it. Fear is your only obstacle. 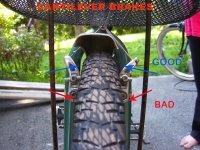 Also check out my other blog called Great Canadian Bike overhaul, it's listed on the left and it has a complete bike rebuild documented. Good luck and never quit! I just purchased an inexpensive coaster bike for quick trips to the store. After looking on the internet I'm concerned about the back-pedal braking down a steep hill. Would you suggest installing a (only) front handlebar brake? Yes I would. Two brakes are always better than one. Use the front one to slow down and finish the job with the coaster. Be careful not to lock up the front wheel. Going over the handlebars is never any fun. Thanks! I will install a front brake before hitting any hills - and hopefully any pavement. With regard to placing cantilever with v-brakes. 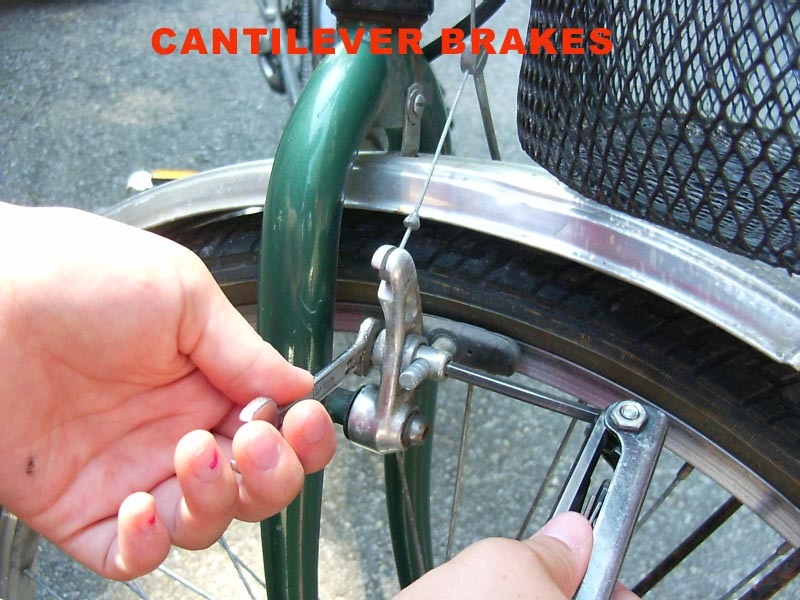 Have you found that you had to change your brake levers as well or use an adapter? I have read that the levers are not compatible. I've been told the same thing. The normal brake handles will not work as good as the ones made for the v-brake. But they will still do the job and a much better one than the normal cantilevers. Your adjustment must be very close but it should still be able to work. I never heard of adapters and replacement brake handles can be found for a decent price or for free on a trashed bike. V-brakes have been around long enough for those to show up in the trash. Good hunting. My new-to-me bike has v-brakes...and while the brakes seem to stop more quickly, the front one squeals like mad, and the rear one doesn't seem to stop the wheel very efficiently. I have never had v-brakes. Which of these many screws is the one which is supposed to adjust the position of the levers? It's hard to explain in a few words. So keep posted for a v-brake tutorial in the coming days. i have very nearly finished doing up my first bike just need help on fitting the brakes. I wish I could help you out. I have worked on one set for an hour and just couldn't get them to work decently. If anybody out there has a secret to these, please share with us! Thank you Raza, it is truly appreciated. I'm happy that I can help people out anytime I can. Keep posted. hey GEYRRY ..glad to see ur reply i want to ask u something abt my cycle ..i want to do wheelie and my bicycle dont have any type of suspensions on both fron or rear but my front side of the cycle is too heavy how can i reduce a little wait to just lift a front wheel ? The only thing that comes to mind would be to go with an aluminum wheel. Low gears also help to pull off wheelies. Good luck and be careful not to hurt yourself. Hi Gerry, I have a road bike with sidepull brakes. But when you pull in the brake, it stop the wheel from spinning but then the brake lever and the brake get seized. Does it just need a nice brake line? You'll have to diagnose by elimination. First, disconnect the cable and see if it moves freely in the housing while pressing the handle, second, squeeze the caliper itself to see if it moves freely. You either have a jammed caliper or your cable is sticking somewhere in the housing. i have an internal hub coaster bike, but in addition to the back-pedal brake it also has both front and back disc (handle) brakes. I would really prefer to free wheel when I am riding - i recently almost had a really big accident because i was trying to manoever out of the way of something and forgot about the back-pedal. it hurt!! Hello Kate, it's the first time that I ear about such a set up on a rear wheel. What I suggest is that you have the rear wheel hub replaced with a freewheel BMX hub that accepts a disc brake. They do exist. just got a bike from the second hand store and its got hydraulic brakes...any idea how to maintain these and keep them working?? I'm sorry, but I have to give you an honest answer: No clue whatsoever! I have a set of v brakes on my bike but as the wheel spins the tyre catches the pad at certain points making pedalling twice as hard. I assume it's a problem with the pad height but have no idea which twisty bit I need to get twisty on. Can you point it out to me on a diagram or something. Hey Zara, you need to do exactly what you see in the picture with the funky green watch bracelet. Adjust the pad until it doesn't rub anymore. If the pad doesn't rub all the time, this tells me that the wheel is out of true. Hey man, a couple weeks ago I got a mint condition '92 trek 400 road bike. Its a really great ride, but the v-brakes squeal like crazy. Is there any way to fix that? Sounds like your pads are not set flush on the rim, just adjust them so. If that doesn't do it, they may be used up beyond adjustment. Replace them with a set of good pads and that should take care of your problem.